We’re very excited to catch Baba Brinkman at the world premiere of his Rap Guide to Culture live on stage next month at a free public event at UT’s Student Union. 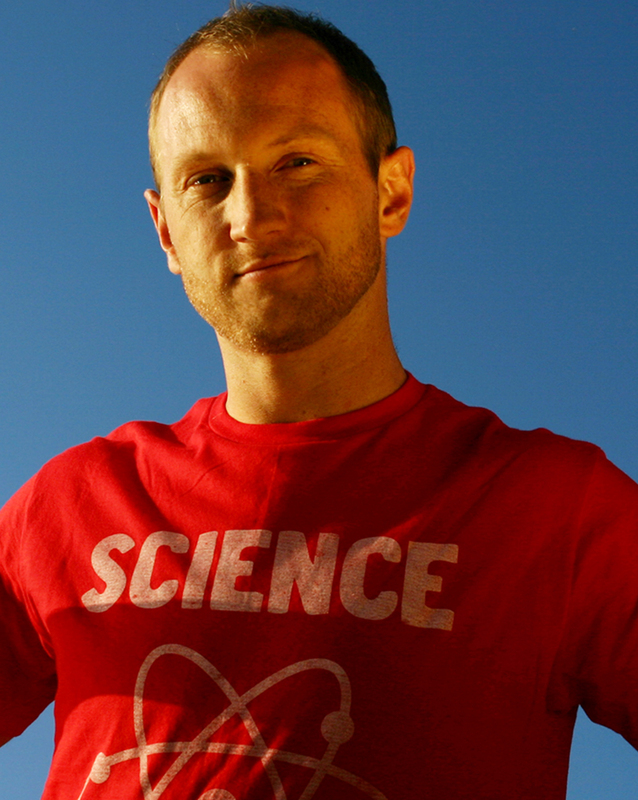 The New York-based award winning playwright, science communicator, and Canadian rap artist is best known for his ‘Rap Guide’ series of science-themed plays, and he’s gained worldwide fame with successful runs at the Edinburgh Fringe Festival, the World Science Festival, and a series of off-Broadway plays. Lucky for us, Baba is returning to NIMBioS where he was a Songwriter-in-Residence in 2012. He will also participate in and perform one of his signature “rap-ups” of the DySoC/NIMBioS Investigative Workshop on Social Norms. We caught up with Baba to find out about his musical aspirations, why he thinks science is redemption, and what to expect in the new performance. Whether or not you’re a rap fan, Baba’s shows always enlighten and entertain. Check out his latest video for Rap Guide to Climate Chaos and a review of the smart song collection. Q. Why rap about science? The findings of science are emerging as the greatest story ever told, both the most inspiring and also the most important to comprehend if we want to alleviate suffering and improve the wellbeing of everyone on this planet. Rap at its essence is a storytelling art form, which makes it a powerful way to tell the stories of science, and also the musical and lyrical power of the genre allows people to connect to the message viscerally, in a way that a lecture can’t achieve, so I’m hoping to spread passion for an curiosity about science, in addition to just dropping some knowledge on people. Q. What can audiences expect from the world premiere of the Rap Guide to Culture? Audiences can expect to encounter a new way of thinking about what culture is and how it works, with rap and hip-hop culture as the “model organism” under investigation. I’ll be breaking down the evolutionary forces that shaped the norms and techniques of my favorite art form, while generalizing them to our species and the recent history of the planet. When you boil it down, culture is biology. It’s a non-genetic evolutionary process that owes its origins to genetic evolutionary processes, and the better we understand how culture is linked to the rest of the life sciences, the more we can steer its evolution in directions that promote positive social outcomes rather than unintended negative consequences. So the show will be about culture but also about saving the world from itself, with science and rap as the unexpected forces of redemption. Q. Is the show suitable for young audiences? The official rating is PG-13, as with my other “Rap Guide” shows, but if parents want to bring younger children, it’s up to them and their assessment of their offspring’s maturity level. I can promise it will be no more salacious than most modern rap, and the mature references and strong language will at least be employed in the service of an overarching educational message. Q. Do you have to like rap to enjoy your show? I’m sometimes described as “rap for people who don’t like rap” so no, if you’re not into rap, you will still have a good time, although you might find yourself asking “Why in the name of Darwin didn’t I like rap before? Where did I go wrong?” On the other hand, if you already like rap, you’re in for a real treat. 4. While at NIMBioS, you will participate in the DySoC/NIMBioS Investigative Workshop on Social Norms. What will your role be? This entry was posted in DySoC, Investigative Workshops, performances, songwriter, Workshop. Bookmark the permalink.